I'm linking up with Manic Monday at Classroom Freebies again this week! Science is the topic this week. I have a set of cards dealing with the 13 Phyla which can be used as partner picking cards, a matching game, a Science center, or whatever else you can think up! They are pretty versatile. 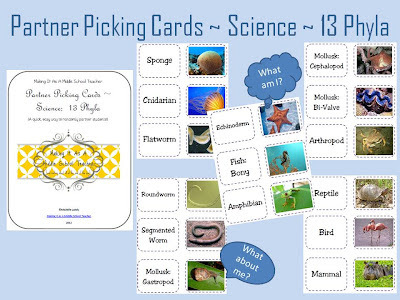 Here's a set of 30 Partner Picking Cards using Middle School/High School Science content. To make a pair, students will need to find the phylum and the animal that go together. These work great as a quick, easy way to randomly pair up students for a task or activity. *These also work great as a matching game for a center or early-finishers. Make sure you click the Manic Monday button up top to see all the awesome free items being offered in today's Link Up! I just finished teaching this unit ... can't wait to add this to my science unit for next year! Thank-you so much for sharing! Thanks, Jen! I hope you find it useful!